Charges in Gray case "rushed from the beginning"
A Baltimore attorney who's been following the cases of the six police officers charged in the death of Freddie Gray said Thursday the charges "were rushed from the beginning." Normally, with cases involving police officers, prosecutors need to take their time, said Sheryl Wood, a former federal prosecutor. Officer Caesar Goodson, the police officer who was driving the van in which Gray was fatally injured last April, was acquitted of second-degree depraved heart murder and other charges Thursday by Judge Barry Williams. 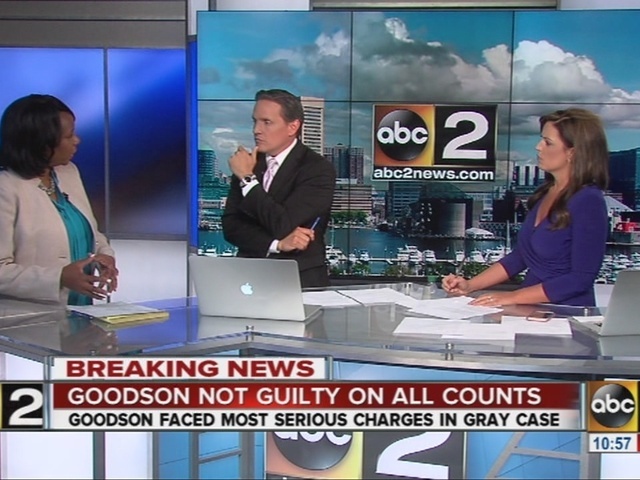 To get a conviction, Wood said, prosecutors would have had to prove Goodson acted intentionally, or was so reckless that his actions led to Gray's death. "That's where they failed," Wood said. Such charges against anyone are hard to prove, but especially against police officers, Wood said. The crux of the state's case hinged on whether Goodson intentionally gave Gray a "rough ride"-- police lingo for a bumpy ride in a police vehicle intended to injure a prisoner. Defense attorneys for Goodson argued Gray tried to hurt himself in the back of the van. Wood said CCTV video played in court did not prove that Goodson gave Gray a rough ride. "Once the state said there was a rough ride, we certainly expected there might be some evidence of that. Running a stop sign and rounding a corner like that is not a rough ride," Wood said. Attorney Warren Alperstein said it was clear during closing arguments that Williams wasn't buying the rough ride theory. Judge repeatedly grilled state prosecutors regarding the rough ride theory, Alperstein said. "It was a little bit of a foreshadowing," he said. Ultimately, the state's failure to prove a rough ride was one of the biggest problems with its case. "That wasn't proven at all," Alperstein said.